The settlement of Angelochori 1 (plate 1) is situated in the northern part of the prefecture of Imathia, about 100 km. west of Thessaloniki. Systematic excavation of the site, carried out by the 17th Ephorate of Prehistoric and Classical Antiquities, began in 1994; at the same time, a non-systematic surface survey was conducted in the surrounding area. This is the only Late Bronze Age settlement in western Macedonia to have been excavated in extent, making it possible to draw conclusions regarding its settlement phases, organization of habitation-areas, economy, and technology. Beginning in 2000, the excavation was included in a research program (the “Angelochori Project”), funded by the Shelby White-Leon Levy Program for Archaeological Publications. In addition, we received modest financial support from the Mediterranean Archaeological Trust. The objective is the publication of the excavation data by the interdisciplinary team 2 that is studying the various categories of material remains. By the end of 2007, we plan to have completed and have ready for publication the first part of the study, which deals with the environment and economy, the stratigraphic sequence of phases in the settlement, and its architecture. The second part to follow will deal with the settlement’s ceramic technology and production, as well as with other groups of finds. In the following we will focus our comments upon the quantitative characteristics of the pottery, specifically on matt-painted ware. The study of pottery typology, technology, and production, like the study of the spatial distribution of pottery and other finds, is still underway. Thus, our observations are more in the nature of a preliminary discussion, rather than final conclusions. The settlement at Angelochori was built on a mound (toumba) nearly oval in shape, and with a modern-day expanse of about 7 stremmata (approx. 1.75 acres). Excavation research has encompassed the summit of the toumba and specific trenches along its slopes. Areas that had been disturbed because of illicit excavations or other modern interventions were not investigated. Residences are positioned on the flat summit of the toumba, and support walls – bulky constructions of sand and clay – surround the settlement on at least three sides, starting from the base of the hill and rising in step-like fashion to its summit. Chronologically the three main phases of habitation belong within the framework of the Late Bronze Age, while surface finds make probable a final phase representing the beginning of the Early Iron Age. This phase has been entirely destroyed by modern removal of earth from the toumba. According to C14 datings of samples, habitation at the settlement began at the start of the 17th century (1690/80 BC) and extended to the middle or end of the 13th century (1260/20 B.C.). This is the chronological horizon of the three main settlement phases. As we mentioned above, habitation continued for some (brief, we assume) period of time following this phase, after which the settlement was abandoned, although human presence at the site did not entirely come to an end. The matt-painted ware constitutes the most characteristic and numerous category of decorated pottery from the site. Even during the phases of surface collection of material and the first excavation seasons, it was obvious that the matt-painted ware held an important place in the ceramic production of the site 3. Systematic study of the pottery during recent years has come to confirm this original impression to a certain extent and has also given it a more particular form. Below are presented the data from the quantitative analysis of the pottery from three neighboring excavation trenches, D, E, and L. All three are at the top of the toumba and very near the center of the expanse that it occupies. The area that corresponds to these three trenches was covered by building remains from residences and open-air spaces belonging to phases II and III of the settlement. Both of these comprise advanced stages of the Late Bronze Age, and we assume – although this remains to be further supported by evidence – that they are related to phases IV and V of Toumba Thessaloniki. The typological study and classification of archaeological material constitutes a basic tool for archaeology in its attempt to understand and interpret cultural phenomena 4. The usefulness of classification lies in its ability to organize the multiple forms/variety of material into categories on the basis of a series of criteria. More specifically, the typological classification of pottery production for an excavation assemblage comprises one of the most important stages of its study and interpretation. The organization of pottery into typical categories on the basis of morphological, technological, functional or other criteria is critical both for determining the chronological framework as well as for exploring other parameters such as its distribution throughout the site, the evolution of style, characteristics of technology, and the organization of production 5. All pottery from each trench was recorded, rather than only characteristic sherds. 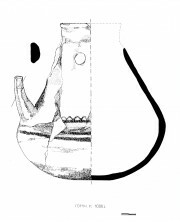 On the form prepared for the recording of the pottery, the following typical distinguishing criteria were employed: that of clay (coarse, medium, fine), that of which portion of the vessel was preserved (body-lip-base-handle), and that of the vase’s shape (open-closed-indeterminate), in combination with the criteria of the vessel’s surface (coarse ware/burnished/striated/matt-painted/incised, etc.). 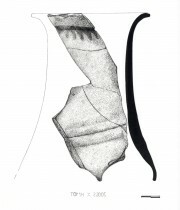 The sherds selected as characteristic were recorded one by one on a special form, on which there was a drawing and detailed observation of all the characteristics that could be observed macroscopically. Those sherds were selected as characteristic that could yield information concerning the shape and/or the size of the vessel, as well about the type and form of its decoration, where this was present. Complete or nearly complete vases from the excavation were recorded on the same form. The next step was the electronic processing of the data from the inventory in a database, which was prepared by the archaeologist Dr. A. Vargas, a computer specialist. Data processing was completed with the defining of questions and parameters by the Archaeological Museum of Thessaloniki’s computing officer, A. Panagiotidis. At the same time that the pottery was being inventoried, Dr. E. Kyriatzi of the Fitch Laboratory/British School at Athens began technical analysis using the thin sections’ method. A study of the paints was conducted using the scanning by electronic microscope (SEM) method by Dr. B. Kylikoglou of the, National Centre for Scientific Research “Demokritos”. The latter research is still ongoing. During this period, the correlation of data from recording and the study of pottery with data from petrographic analysis began. It is estimated that the study of the pottery will be concluded in about two years. The largest numerical categories are those of burnished and coarse ware vessels. In trenches D and E (graph 1 and 2), the burnished ware appears in almost equal or slightly greater percentages (42% and 46% respectively) than coarse ware (41% and 37% respectively). In trench L (graph 3), the percentage of burnished ware continues to be greater with respect to the total of pottery found, now comprising a decisive majority (56%), while inversely, the percentage of monochrome coarse ware is limited to 22%. This fact is in direct correlation with the nature of the excavated areas, from which the pottery came: in trenches D and E there were storage spaces, something which does not apply – or applies to a lesser extent – for trench L. We now proceed to a further step in our reasoning. 2.i. Passing on to the decorated pottery, specifically to the matt-painted ware, which is the main topic of our discussion here, we observe that in trench E (graph 2) the percentage of decorated pottery (including here the following groups: matt-painted, incised, impressed, Mycenaean, with plastic decoration, burnished, striated, slipped) is confined to between 5% and 8%, while in trench L (graph 3) it reaches almost 15%. We could thus say that the percentages of coarse ware are inversely proportional to those both of burnished ware as well as decorated pottery, a detail which, as we mentioned above, is in direct correlation with the use of the spaces, from which the pottery from these trenches came. 2.ii. Examining the composition of this specific pottery category, viz., decorated ware it is eminently clear that the dominant group is that of matt-painted ware in all three trenches that were examined. More specifically, in trench D (graph 4) matt-painted ware accounted for 63% of the decorated pottery, 73% in trench E (graph 5), and 69% in L (graph 6). Incised pottery lags behind, with 15% in trenches D and L and 9% in trench E. Mycenaean pottery is limited to between 3% and 8% of the decorated pottery, while as a percentage of all pottery it falls to 1% or even less. This fact, which we will comment upon below, is in contradistinction to what occurred at sites in central Macedonia, where the Mycenaean pottery comprised the preeminent ceramic category during the mature phases of the Late Bronze Age, gradually displacing matt-painted ware 6. The remaining groups of decorated pottery are also limited to low percentages, normally 2-3% of all decorated pottery and less than 1% of the entire pottery assemblage. We thus could say that the preeminence of matt-painted ware is indisputable and that the actual percentages are definitely larger, if we take into consideration that sherds inventoried as yellow, red, and gray burnished ware probably belonged to matt-painted vases. 2.iii. If we combine the elements of observations 2.i and 2.ii, we see that the quantity of matt-painted ware is not equally high in trenches D/E and L. That is, what was observed concerning the analogy between coarse and burnished ware, of which we had remarked that they are inversely related – in correlation to the use of the spaces from which the pottery came – does not hold. A similar relation appears to be created in the analogy between undecorated and decorated pottery: in trench L – which has the lowest percentage of coarse ware – there is the highest percentage of decorated pottery, while conversely in trenches D and E, which have a higher percentage of monochrome coarse ware, low percentages of decorated pottery appear. 3. The percentage relations obtained between the various categories of decorated pottery differ from those described above in relation to the relative percentages of the various categories of undecorated pottery. Here there is a relatively stable relation among the various categories: the matt-painted group is continuously in the lead with high percentages – over 60%, always followed by incised pottery and then, with small variations and distinctions, by the remaining categories of decorated pottery. 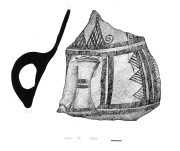 The stable correspondence between the categories of decorated pottery, independent of the entire ceramic assemblage from a trench, may be further commented upon: it is clear that the matt-painted ware constituted the most popular category of decorated pottery at Angelochori, appearing in a range of shapes: amphoras (fig. 1, 2, pl. 2), pithoid vessels (fig. 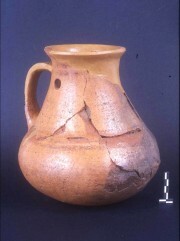 3, 4, 5), jugs (fig. 6, pl. 3), cantharoid and/or sigmoid bowls (fig. 7-11) with high-swung handles, sometimes with a simple, truncated base and other times with a conical foot (pl. 4). As has been remarked on the matt-painted pottery from other Macedonian sites, it is the case that all the matt-painted vases are connected to the storage, transfer, and consumption of liquids. We shall now proceed to see whether the picture created at other Late Bronze Age settlements in Macedonia has points in common with that which has emerged to date from the study of the pottery from Angelochori. From the areas of Macedonia west of Angelochori (Aiani, Haliakmon, Kastoria), there are as yet unpublished details on the basis of which to make comparisons, so we shall refer only to the data from the region east of the settlement, i.e. the area of central Macedonia. There the settlements of Kastanas 7, Toumba Thessaloniki 8, and Assiros (Langada) 9 are located, from which we have data concerning pottery production in the Late Bronze Age 10. At Kastanas, matt-painted pottery appears from the first settlement strata (19 and 18), which correspond to the beginning of the Late Bronze Age (1600-1400 BC). Percentages rise throughout the same period (1400-1200 BC) (strata 17 and 16), only beginning to fall gradually in strata 15 and 14b, which represent advanced stages of the Late Bronze Age. There is an impressive decline in matt-painted wares in stratum 14b, which represents the end of the period and essentially their disappearance from strata in the Iron Age, since the very few sherds found here are considered accidental transfers from earlier strata 11. Wheel-made pottery in Bronze Age strata (16-13) ranges from 6%-20%, but significantly increases (to about 45%) in strata 12 and 11, which represent the end of the Bronze Age or beginning of the Iron Age 12. At Assiros, although I do not know the specific percentages, matt-painted ware is referred to as one of the five basic categories of handmade pottery; together with incised ware, it is noted as not especially popular either before or after the arrival of Mycenaean pottery 13. The latter is found in percentages comparable to those at Kastana, but with the passage to the Early Iron Age we observe exactly the opposite phenomenon of that noted for Kastanas, i.e., here the quantity of wheel-made pottery is gradually reduced to very small percentages during the initial phases of the Early Iron Age 14. Commenting upon pottery production at Assiros, the excavator stressed that in general the percentage of Mycenaean pottery relative to the entire pottery assemblage is very low, 5% at most, and never approaches the percentages of local burnished wares 15. At Toumba Thessaloniki the study of the handmade and Mycenaean style pottery of the Late Bronze Age, both from the standpoint of ceramic technology and production as well as from that of its style and social uses, has yielded important results 16, useful as a basis for comparison for material from other settlements dated to the same period. Thus it has been determined that matt-painted ware appears in phase VI, which constitutes an early phase of the Late Bronze Age, at a rate of 5%, consolidates its presence in the settlement’s pottery production during phase V with 22%, and then declines in phase IV to 8% 17. Mycenaean style pottery appears at this site in phase V – an advanced phase of the Late Bronze Age and also the era in which matt-painted pottery reached its apogee - at a rate of 4%, to gain preeminence in phase IV, at the end of the Bronze Age, with 26% 18. 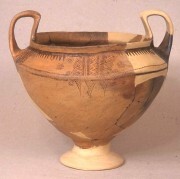 The large increase in the percentage of Mycenaean pottery, which is combined with a decrease in the percentages of other categories of decorated pottery, including matt-painted ware, has been the subject of much contemporary research. The interpretation of the phenomenon within the wider framework of Mycenaean presence in Macedonia has been the focus of research during recent years 19, and it appears that there continues to be room for discussion and reexamination of many issues. a) Matt-painted pottery presents an impressive tendency to increase during the passage from the early to late phases of the Late Bronze Age. This is clear from the data of Toumba and Kastanas, and supported by the data from Angelochori. Despite the fact that the statistical evidence presented here stems only from phases II and III of Angelochori, our study clearly demonstrates, on the one hand, its presence as early as the earliest phase IV of the settlement – the beginning of the Late Bronze Age – and, on the other hand, its rapid increase during phases III and II – the advanced stages of the Late Bronze Age. b) At Angelochori, Thessaloniki and Kastanas, and probably at Assiros as well, matt-painted pottery comprises the predominant category of handmade decorated pottery in the Late Bronze Age. Its presence in the ceramic production of these settlements, as we have said, is a phenomenon presenting a developmental course, which is related both to knowledge about and improvement of the technique itself, but chiefly having to do with the social use of this ceramic category 20. Matt-painted pottery is one of the few cases in which a pottery category may be connected to changes in the living standard of a community. c) Both at the settlement of Kastanas 21 and at that of Toumba Thessaloniki 22 it was observed that in the strata preceding the appearance of matt-painted pottery (stratum 19 and phase VII respectively), which are assigned to the outset of the Late Bronze Age, the only category of decorated pottery is incised ware, a fact that supports the view maintaining that the origins and initial phases of this pottery category are to be placed in the Middle Bronze Age 23, of which it appears to constitute the most characteristic category of decorated pottery. d) Despite the fact that a good number of the percentages given here may change as the study of the pottery from Angelochori proceeds, there are two facts that demonstrate the general trend in ceramic production at the settlement: one is related to the predominance of coarse and burnished wares, a predominance that does not seem to be shaken in any phase of the settlement’s life. The second concerns the particularly low ratios of Mycenaean pottery, which places Angelochori in a completely different position from that of Toumba Thessaloniki and Kastanas – and, to a degree, Assiros. Given that Angelochori is the first Late Bronze Age settlement in the region west of the Axios River from which we have data, it is important for us to understand that it is now likely that yet another parameter for this period in Macedonia will arise. 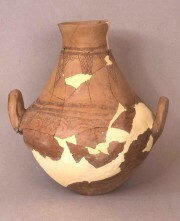 As has been pointed out regarding the settlements in central Macedonia 24, the distinctive place of each settlement within the overall settlement system is now becoming clear; in addition to other factors, this is expressed by the presence of Mycenaean pottery. Thus, there appears a distinction between settlements west of the Axios, within the modern plain: while the transition to the Late Bronze Age in central and western Macedonia occurred nearly at the same time and in the same way, with the distinguishing characteristics of matt-painted pottery and the presence of particular spatial-organization elements (e.g., constructions on mountainsides), in the mature phases of this period settlements in central Macedonia – and, we could say, primarily those found around the Thermaic Gulf – entered a phase of contact with Mycenaean societies and traditions. Indeed, it appears that the more distant a site was from the coast, the more rarely products from workshops that made Mycenaean style pottery reached it. Settlements in the Macedonian hinterland, like Angelochori, were aware of and came into contact with developments, but they chose to remain attached to their own traditions in pottery production, with matt-painted ware constituting the best-known and preferred category of decorated pottery. We assume that in western Macedonia settlements even farther removed from the coast than Angelochori or from land routes like those that appear to have linked the area around Kozani with the Mycenaean south, the attachment to tradition would have been even more powerful, and thus the echoes of Mycenaean influence even fainter. In closing, we could say that on the basis of the picture being recreated, the settlements of Macedonia belong to more than two “tracks”, as a consequence of their natural setting, the possibilities for communication among themselves and their place within the pre-existing settlement/economic system. 1See in general: Ν. Μερούσης – Λ. Στεφανή, Προϊστορικοί οικισμοί του νομού Ημαθίας Α΄, Μακεδονικά ΚΘ, 1994, 339-366; Λ. Στεφανή, Οικισμός της Ύστερης Εποχής του Χαλκού στο Αγγελοχώρι Ημαθίας: πρώτη ανασκαφική έρευνα, Το Αρχαιολογικό Έργο στη Μακεδονία και στη Θράκη 8, 1994, 125-129; Λ. Στεφανή, Η ανασκαφή στον οικισμό της ΥΕΧ στο Αγγελοχώρι Ημαθίας (1996-1997), Το Αρχαιολογικό Έργο στη Μακεδονία και στη Θράκη 11, 1997, 101-108; L. Stefani – N. Meroussis, Incised and Matt-Painted Pottery from Late Bronze Age Settlements in Western Macedonia: Technique, Shapes and Decoration, ΤΕΧΝΗ, Craftsmen, Craftswomen and Craftsmanship in the Aegean Bronze Age, AEGAEUM 16, 1997, 353-359. Ν. Μερούσης – Λ. Στεφανή, Κατοίκηση και φυσικό περιβάλλον στην προϊστορική Ημαθία: συμπεράσματα και προοπτικές από την επιφανειακή έρευνα των ετών 1993-1996, Αρχαία Μακεδονία VI, v. II, Θεσσαλονίκη 1999, 735-751; Λ. Στεφανή – Ν. Μερούσης, Οι προϊστορικές έρευνες στην Ημαθία. Παλιά και νέα δεδομένα, Α΄ Μέρος, Αρχαιολογία 88, 2003, 34-38; Λ. Στεφανή – Ν. Μερούσης, Οι προϊστορικές έρευνες στην Ημαθία. Παλιά και νέα δεδομένα, Β΄ Μέρος, Αρχαιολογία 89, 2003, 64-72; Λ. Στεφανή – Ν. Μερούσης, Τοπίο στην ομίχλη. Η 2η χιλιετία στην κεντρική πεδιάδα της Δυτικής Μακεδονίας, Β΄Διεθνές Διεπιστημονικό Συμπόσιο “Η Περιφέρεια του Μυκηναϊκού Κόσμου”, Λαμία 1999, Αθήνα 2003, 227-242; Λ. Στεφανή – Σ.Μ. Βαλαμώτη – Α. Κωνσταντινίδου, Το ερευνητικό πρόγραμμα του προϊστορικού οικισμού Αγγελοχωρίου. Οι γεωργοκτηνοτροφικές δραστηριότητες και οι διατροφικές συνήθειες στο Αγγελοχώρι της ΥΕΧ, Το Αρχαιολογικό Έργο στη Μακεδονία και στη Θράκη 18, 2004, 431-437; Ν. Μερούσης, Ο Κοινοτικός Χώρος και οι Κοινωνικές Σχέσεις, in Δ. Γραμμένος (ed.) Προϊστορική Μακεδονία (forthcoming). (stone tools), E. Kyriatzi and B. Kylikoglou (technological study of the pottery with petrographic analysis and SEM), K. Kouli (palynology), A. Konstadinidou (archaeozoology), G. Maniatis and cooperators (archaeometry), N. Merousis (clay small finds), S. Chatzitoulousis (clay daub remains), R. Christidou (bone tools) and L. Stefani (stratigraphy, architecture, pottery). 3 Stefani – Meroussis (supra n.1) 356-357. 4See relevant studies: J. Hill and R. Evans, A Model for Classification and Typology, in D. L. Clarke (ed. ), Models in Archaeology, London, 1972, 231-273; W. Adams and E.A. Adams, Archaeological Typology and Practical Reality: A Dialectical Approach to Artifact Classification and Sorting, Cambridge, 1991, (1995). I. Hodder, Reading the Past, Cambridge, 1986 (1993), 135-136; Adams and Adams (supra n. 4); El. Chilton, One Size Fits All. Typology and Alternatives for Ceramic Research, in El. Chilton (ed. ), Material Meanings. Critical Approaches to the Interpretation of Material Culture, Salt Lake City, 1999, esp.44. 6 Ε. Κυριατζή, Κεραμική Τεχνολογία και Παραγωγή. Η Κεραμική της Ύστερης Εποχής του Χαλκού από την Τούμπα Θεσσαλονίκης, Θεσσαλονίκη 2000 (Ph.D.), 258. 7About the settlement and the excavation see: B. Hänsel, Kastanas. Ausgrabungen in einem Siedlungshügel der Bronze- und Eisenzeit Makedoniens 1975-1979. Die Grabung und der Baubefund, PAS 7, Berlin 1989. 8 About the settlement and the excavation see : Σ. Ανδρέου – Κ. Κωτσάκης, Η Προϊστορική Τούμπα της Θεσσαλονίκης. Παλιά και νέα ερωτήματα, Το Αρχαιολογικό Έργο στη Μακεδονία και στη Θράκη, 10, 1996, 369-388; Σ. Ανδρέου – Κ. Κωτσάκης, “Μυκηναϊκή Παρουσία” και “Μυκηναϊκή Περιφέρεια”: Η Τούμπα της Θεσσαλονίκης, μια θέση της Εποχής του Χαλκού στη Μακεδονία, , Α ΄Διεθνές Διεπιστημονικό Συμπόσιο “Η Περιφέρεια του Μυκηναϊκού Κόσμου”, Λαμία 25-29 Σεπτεμβρίου 1994, Αθήνα 1999, 107-116, with relevant bibliography. 9 About the settlement and the excavation see: K. A. Wardle, Excavations at Assiros 1975-1979. A Settlement Site in Central Macedonia and its Significance for the Prehistory of South East Europe, BSA 75, 1980, 229-265; K.A. 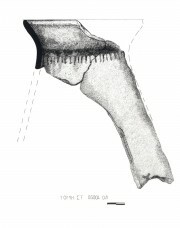 Wardle, Excavations at Assiros Toumba 1988, a Preliminary Report, BSA 84, 1988, 447-463. 10Kastanas: For the handmade pottery see: A. Hochstetter, Kastanas. Ausgrabungen in einem Siedlungshügel der Bronze- und Eisenzeit Makedoniens 1975-1979. Die handegemachte Keramik, PAS 3, Berlin 1984. For the wheelmade pottery see:. R. Jung, Kastanas. Ausgrabungen in einem Siedlungshügel der Bronze- und Eisenzeit Makedoniens 1975-1979. Die Drehscheibenkeramik der Schichten 19 bis 11, PAS 18, Kiel 2002; R. Jung, Η μυκηναϊκή κεραμική της Μακεδονίας και η σημασία της, Β ΄Διεθνές Διεπιστημονικό Συμπόσιο “Η Περιφέρεια του Μυκηναϊκού Κόσμου”, Λαμία 1999, Αθήνα 2003, 211-225, with relevant bibliography. J. Winder (eds. ), Proceedings of the International Conference Wace and Blegen: Pottery as Evidence for Trade in the Aegean Bronze Age. 1939-1989, Amsterdam 1993, 117-141; K. Wardle, D. Wardle and N.M.H. Wardle, The Symposium in Macedonia: A Prehistoric Perspective, Το Αρχαιολογικό Έργο στη Μακεδονία και στη Θράκη 15, 2001, 631-643. 11 Hochstetter (supra n. 10), 181-188, fig. 47. 12 Hochstetter (supra n. 10), 12, fig. 1; Jung 2003 (supra n. 10), 213. 13Wardle 2001 (supra n. 10), 636. 14 K. Wardle, Change or Continuity: Assiros Toumba at the Transition from Bronze to Iron Age, Το Αρχαιολογικό Έργο στη Μακεδονία και στη Θράκη 10A, 1996, 448, 455. 15Wardle 2001 (supra n. 10), 639. 16Κυριατζή (supra n. 6); Ψαράκη (supra n. 10), with relevant bibliography. 17 Ψαράκη (supra n. 10), 106-107, graphs 33, 34 and 35. 18Ψαράκη (supra n. 10), 107, graphs 34 and 35. 19Andreou (supra n. 10), Ανδρέου (supra n. 10); Wardle (supra n. 10). 20 Ανδρέου (supra n. 10), esp. 201, Ψαράκη (supra n.10,) 272 et sec. 22Ψαράκη, (supra n.10), 106, graph 32. 23Ν. Μερούσης- Α. Μποβολή, Λ. Στεφανή, Εγχάρακτη κεραμεική της Εποχής του Χαλκού από το Αρχοντικό Πέλλας, Μακεδονικά 30, 1995-1996, Θεσσαλονίκη 1996, esp. 203-204. Stefani, L. "Angelochori: A Late Bronze Age Settlement in Western Macedonia." 3 May. 2007. In: Horejs, B. - Pavúk, P. (eds. ): Aegean and Balkan Prehistory. http://aegeobalkanprehistory.net/index.php?p=article&id_art=7 (24 Apr. 2019).